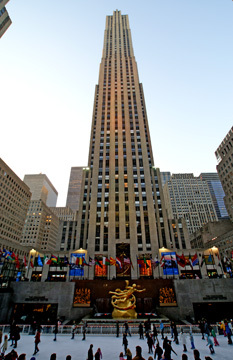 The world's finest Art Deco commercial complex and best private urban renewal project, Rockefeller Center abounds in good design and craftsmanship and its centerpiece is 30 Rockefeller Plaza, its tallest structure that looms over the famous sunken plaza with its gilded statue of Prometheus, shown above, by Paul Manship. "The finished figure had the stylized hair and blank expression of ancient Greek sculpture that was Manship's trademark. But it also had Manship's typical emphasis on lithe movement. Installed in early 1934, the eight-ton bronze sculpture had Prometheus flying almost horizontally, with a clump of fire in his right hand, through streams of water over a zodiacal ring. Edward Alden Jewel, writing in The New York Times, called Prometheus 'a genuine masterpiece, beautiful in its rhythm.' But he acknowledged that another critic, the actor and writer Frank Craven, considered it 'a boudoir knicknack.' Manship's unhindered success inspired detractors who saw in him an upper-class toady irrelevant to the dead-serious modernism of the 1930's....Manship had many reservations about the completed work. He thought he had been hurried by the twelve-month schedule, and the horizontal fighure of Prometheus was not consonant with the verticality of 30 Rockefeller Plaza." Sometimes artists forget that the first impulse is usually the best and that counterpart is more exciting than context or "boudoir knicknacks." When it was built, midtown had not yet developed into the commercial real estate juggernaut it has become. Most of the properties on the site were occupied by low-rise rooming houses and brownstones. The enormous project actually began when major patrons of the Metropolitan Opera thought that its home in the Garment Center was no longer good enough for its well-heeled patrons. A variety of schemes were developed including plans to build a new opera house in the northern end of Central Park, another to straddle Park Avenue at 96th Street, and banker Otto Kahn purchased a large site on 57th Street between Eighth and Ninth Avenues for which architect Joseph Urbann designed a gigantic circular opera house with a giant office tower serving as its campanile. The original plans, which became known as Metropolitan Square, did not arouse sufficient interest from the opera's major patrons, however, although John D. Rockefeller Jr., who lived on West 54th Street off Fifth Avenue, had been approached to participate in its funding. Rockefeller, who had already embarked on several major real estate ventures such as the Riverside Church and International House in upper Manhattan and Colonial Williamsburg in Virginia, leased three blocks of low-rise buildings from Columbia University between 48th and 51st Streets, a property known as the university's “Upper Estate,” which had been given to the university by the state which had received it as a donation from Dr. David Hosack. Hosack, who had been the doctor who attended Alexander Hamilton after his duel with Aaron Burr, had developed the site as the Elgin Botanic Garden, name after his hometown in Scotland. One of the new plans for this midtown site called for the opera house to be housed on the site on Fifth Avenue in a building with an elliptical plan, but the opera bowed out of the proposal, leaving Rockefeller with a major dilemma because the Depression boded poorly for real estate development. He bit the bullet and his plan, worked on by several major architectural firms, but finally shaped into coherent form by Raymond Hood, provided the city with a far more impressive and widely visible monument than an opera house, 30 Rockefeller Center, a 70-story, 850-ft.-high slab skyscraper whose form is subtlety modulated by stepped setbacks and fully clad in gray Indiana limestone as are of the similarly styled though smaller 13 other buildings in the original complex. The consistent style was broken in the center's westward expansion in the late 1950's across the Avenue of the Americas, which had an elevated transit system when the complex opened and therefore was far less desirable as a prime office location than Fifth Avenue. From the street, the tower soars over the Channel Gardens between the low-rise British Empire and La Maison Francaise buildings with a majesty unrivaled in the city. Despite its bulk, the width of the tower's slab shaft is proportionally small. The visual impact is greatly heightened by the fact that the gardens slope gently downward toward the sunken plaza and its neat and brilliantly colored, formal forest of national flags. The flags not only add desperately needed color to the otherwise drab gray limestone of the complex, but also motion, which is reinforced in the winter when the plaza is converted to the world's most famous ice rink. The somber dignity of the center's facades is lightened by its art. 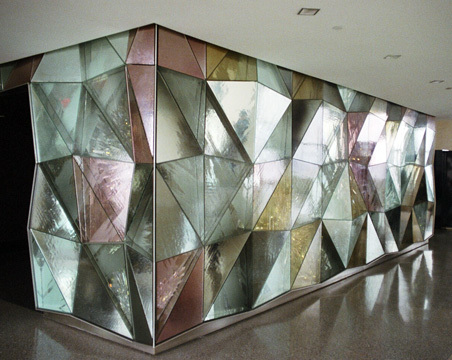 Lee Lawrie's “Wisdom, Light and Sound,” shown at the right, is a brilliantly conceived entrance to 30 Rockefeller Plaza, combining an angled indentation and sculpted glass blocks to dynamically express the ceremony of entrance. Lawrie also designed the spectacular “Atlas” statue, shown below, in the entrance court of the 38-story International Building facing St. Patrick's Cathedral. The “Atlas” and the Prometheus” statues are certainly the finest 20th Century public sculptures in the city, if not the world: monumental and memorable artworks of great grace and stupendous strength in dazzling and prominent settings. Other important art at the center include Hildreth Meiere's large, enameled metal roundels, “Spirits of Song, Drama and Dance,” on the 50th Street facade of the Radio City Music Hall building; Isamu Noguchi's stainless steel plaque, “News,” over the entrance to the Associated Press Building; Attilia Piccirilli's glass block bas-relief, “Youth Leading Industry,” over the Fifth Avenue entrance to the north wing of the International Building at 636 Fifth Avenue; Giacomo Manzu's bronze sculptures, “The Italian Immigrant” and “Italia,” at the entrance to the Palazzo d'Italia in the south wing of the International Building at 626 Fifth Avenue, which was given to the center by Fiat of Italy and replaced another Piccirilli glass bas-relief; and Carl Paul Jennewein's bronze “Industries of the British Commonwealth” over the entrance to the British Empire Building at 620 Fifth Avenue; and Alfred Janniot's gilded bronze bas-relief, “The Friendship of France and the United States,” over the entrance of La Maison Francaise at 610 Fifth Avenue. Handsome gilded carvings and other sculptures abound on the facades of the original complex. The interiors were not to be barren, either. A list of competitors, approved by Rockefeller, to do murals for the expansive lobby at 30 Rockefeller center included Matisse, Picasso, Frank Brangwyn, Jose Maria Sert and Diego Rivera. Picasso, however, declined to even meet with some of the project's architects to discuss the project and Matisse disdained the notion of bustling people in an office building lobby being able to be “in a quiet and reflective state of mind to appreciate or even see the qualities” in his art. Sert and Brangwyn agreed to do murals, entitled “Man's Intellectual Mastery of the Material Universe,” and “Man's Conquest of the Material World,” respectively for the elevator bank section of the lobby and Rivera was commissioned for the lobby fronting the entrance. Rivera, an avowed Communist, had been suggested for the competition by John D. Rockefeller Jr.'s son, Nelson Rockefeller, whose mother, Abby Aldrich Rockefeller, had commissioned Rivera previously to paint portraits of her grandchildren. Rivera's mural, “Man at the Crossroads Looking with Uncertainty but with Hope and High Vision to the Choosing of a Course Heading to a New and Better Future,” was decidedly Marxist in content and when someone noticed that a laborer bore a marked resemblance to Lenin a major controversy erupted. Rockefeller was so angered that Diego was dismissed and several months later the mural was destroyed before it was ever shown to the public and replaced by the present mural, “Man's Conquests,” by Sert. Although the sepia color of the murals, shown above and below, is rather drab, they are impressive and interesting nonetheless. The center would have later controversies over a proposal to erect an office tower over Radio City Music Hall, and the sale of much of the ownership of the center to the Japanese, but nothing was as publicly scandalous as the Rivera episode. What was worse, however, was the center's decision in 1986 to close its observatory atop 30 Rockefeller Center to provide more space for its Rainbow Room and Rainbow Grill restaurant/lounge complex. The multi-level observatory was the best in the city. Most architecture critics were too busy raving about the refurbished Rainbow Room to notice the loss. Patrons of the restaurants have views but they are constrained and in no way comparable to the unrestricted vistas that the observatory offered. 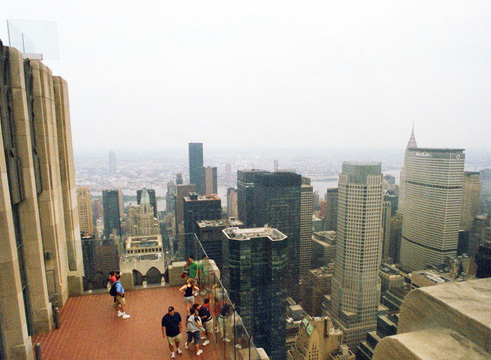 In an article in the November 11, 2003 edition of The New York Post, Steve Cuozzo reported that "Rob Speyer, head of New York operations for Tishman Speyer, which owns Rockefeller Center with Chicago's Crown family," said the observatory will reopen in 2005 under a new plan that calls for an entrance on West 50th Street that will lead to a mezzanine where elevators will ascend to the 67th floor and its "fantastic 16-foot, floor-to-ceiling windows." The article did not indicate whether the new public access will be allowed to the observatory's great outdoor terraces and rooftop. The new plan is subject to approval by the city's Landmarks Preservation Commission. 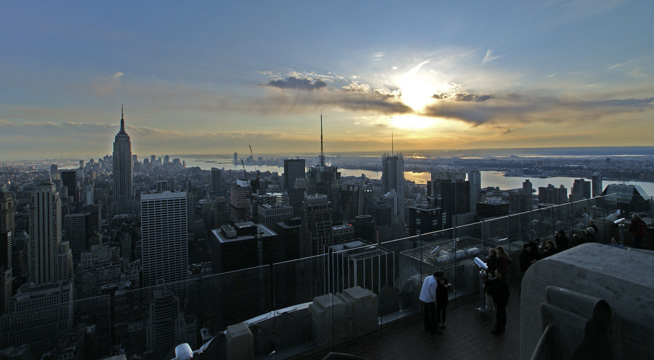 In a March 11, 2005 article in The New York Times, David Dunlap reported that the observatory will reopen in the fall of 2005 with a $14 admission charge. He noted that visitors will board elevators "with glass ceilings and watch the ascent along illuminated shafts to the 67th floor where they will find indoor observation areas," adding that "escalators will take them higher yet, to outdoor terraces on the 69th floor, shielded from the wind by new eight-and-a-half-foot-high glass barriers." "But the 70th-floor summit, 850 feet above the street, will still be completely open to the elements," he continued, noted that the observatory was closed in 1986. 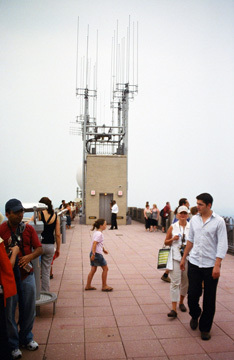 The Top of the Rock observatory did open at the end of 2005 at a reported cost of about $75 million with tickets available online for specific times. In the old days, the trip to the observatory was in taking an elevator in the main lobby of the building. Now the observatory has its own special entrance on West 50th Street that is very large and lavish with a huge chandelier in the entrance that leads to very nice graphic displays of the history of the building. On the second floor of this "entrance," visitors walk over a girder flanked by glass flooring that reveals construction workers below, a very neat and impressive bit of showmanship. Visitors are then ushered into one of two small elevators with glass roofs for rides up an illuminated elevator shaft to arrive at the bottom of the three-level observatory atop the building. Visitors are at first struck by the stunning large glass prism walls at this level that has very high ceilings and very tall windows. Escalators then take visitors up one level where there are outdoor promenades with large glass walls and a gift shop. Finally, one can walk up one flight to the roof that apart from some high-tech antennas has unobstructed views in all directions, the best in the city and well worth the more than $15 price of admission. A few years later, however, the price of admission had climbed to $25 for adults. The center survives, of course, but much of its success had less to do with its art program than with its urban design, its location as the city's prime office market shifted uptown after World War II and with its maintenance program, widely regarded as the best in the real estate industry. retail spaces, but are relatively attractive. The Channel Gardens promenade, shown at the left, from Fifth Avenue down to the sunken plaza constitute probably the city's finest public space despite its relatively small size. Wonderful, very animated fountainheads, sculpted by Ren� Chambellan, who also was a major designer for the Chanin Building on West 42nd Street, another Art Deco masterpiece, are surrounded by benches and lush landscaping that is changed seasonally. 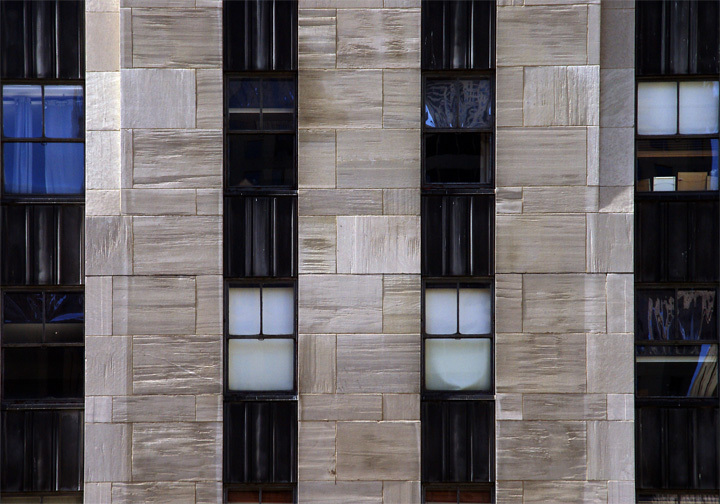 The flagstone promenade is lined with consistent retail frontages and the spatial relationships are cozy despite the vertiginous 30 Rockefeller Center tower. 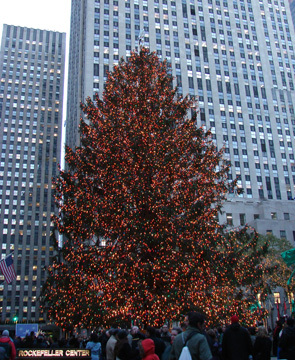 At Christmas time, of course, the center's enormous lighted Christmas Tree, placed above the fire-carrying Prometheus on Rockefeller Plaza, the three-block-long private, north-south street that the center created, makes the promenade/sunken plaza the world's most spectacular and popular hearth. Taking a cue from the ring of flags around the sunken plaza, the center installed fixed banners on all the lampposts around its properties on both sides of the Avenue of the Americas. The banners definitely enliven the streetscape and are occasionally changed, but sadly their design has not always been inspired and free-flying flags would have been more attractive, although obviously more expensive to maintain. 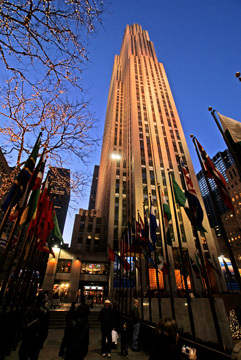 When GE decided to replace the large red RCA sign on the north and south sides near the top of 30 Rockefeller Center with its own red GE sign, it miffed some traditionalists who had for decades referred to 30 Rockefeller Plaza as the RCA Building. Amusingly, RCA was originally the lead tenant in the tall, but slender Art Deco tower at 570 Lexington Avenue that has served as the campanile for St. Bartholomew's Episcopal Church on Park Avenue between 50th and 51st Streets. 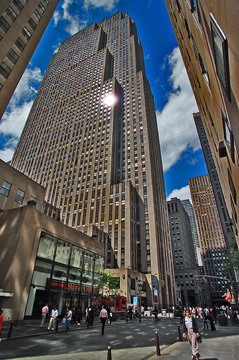 When RCA was lured to Rockefeller Center, its building became the GE building. That building recently was donated to Columbia University after GE put its sign up at 30 Rockefeller Plaza, bringing a historical cycle full-circle. The GE sign is no improvement over the RCA sign. There is nothing wrong with placing a well-designed logo atop a building, but these Art Deco-style thin font signs simply were and are intrusive, tasteless and inappropriate. One can excuse the somewhat similar Radio City Music Hall sign because it is a marquee and because it's not as highly visible. When you've got the goods, as Rockefeller Center does, you don't have to flaunt it. The 5,960-seat Radio City Music Hall was one of two theaters originally built at the center. The other, the 3,509-seat RKO Roxy was later called the Center Theater, but was razed in 1954 for the new U.S. Rubber Company Building in the center, which is now named the Simon & Schuster Building. Roxy was the nickname of Samuel Lionel Rothafel who had built the very large and famous Roxy movie theater, then the world's largest, in 1927 on 50th Street between Sixth and Seventh Avenues. The Roxy, which featured the Roxyettes chorus line that set the precedent for the Rockettes at Radio City Music Hall, was subsequently razed as have been most of the city's greatest movie palaces, a preservation horror story that in its aggregate was even worse than the loss of the former Pennsylvania Railroad Station. Radio City Music Hall continues to be one of the city's great tourist magnets, but is more impressive for its scale than its decor, which was coordinated by designer Donald Deskey. 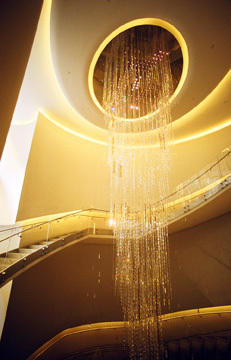 The large mural, entitled “Quest for the Fountain of Eternal Youth,” over the grand lobby staircase is by Ezra Winter. Yasuo Kuniyoshi decorated the women's room and Stuart Davis the men's room, the latter mural entitled “Men Without Women.” Louis Bouche's murals of American scenes against a black background in the downstairs lounge was designed to encourage patrons to be quiet. 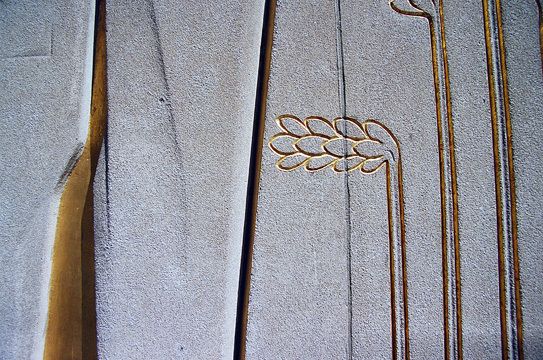 Paul Manship designed the bas reliefs on the orchestra doors. Shortly before the theater opened, Roxy removed three statues of naked women by William Zorach, Given Lux and Robert Laurent because he thought they might be controversial. The art program for the theater was ambitious at least in concept if not execution, but it is the theater itself that is the most impressive achievement. Its enormous semi-circular proscenium arch is banded with colored lights behind each band to permit the theater's “color orchestrator” to “paint” the sunrise that the stage abstractly looks like. With three very deep, but relatively shallow mezzanines, the auditorium lessens the vastness of its space by extended its stage along its sides. Real estate holdouts and difficult economic times prevented the center from achieving a more symmetrical unity. The south end of Rockefeller Plaza sorely needs to be tied into the center and its northward expansion was blocked by holdouts. The two low-rise bases on Fifth Avenue of the International Building mirror the British Empire and La Maison Fran�aise buildings on the block to the south creating a superbly consistent and rhythmic modulation that ideally could have been extended. Overall, this pinstripe enclave is rather conservative and somber, yet its glories far outweigh its imperfections, especially given the historic context of the Depression when it was built. Its wonderful statue of Atlas, by Lee Lawrie, shown at the right, not only is very impressive but it also provides much needed space to appreciate the glories across Fifth Avenue of St. Patrick's Roman Catholic Cathedral. In the mid-90’s, the Japanese owners realized that they had paid too much for their interest in the center and a battle ensued over its mortgage with David Rockefeller, then the patriarch of the family, whose younger generation had forced the sale to get more money, eventually regaining control. The dignified, homogeneous character of the huge center was severely diminished by its westward expansion across the Avenue of the Americas and the generally inferior architectural quality of that expansion. A new expansion planned to extend to Seventh Avenue was announced at the beginning of the 90’s, but was stymied for a few years by the city’s real estate depression. It promises a return to quality. In 1997, the center was acquired by an investment group headed by Tishman Speyer Properties that launched a major program to upgrade its retail spaces. It lured Christie's, the famous auction house, from Park Avenue, but in 1998 its proposal to alter some of the center's retail frontage by enlarging store windows incurred the justified wrath of many preservationists who felt such changes were not only unnecessary but a serious encroachment on the aesthetic integrity of the world's greatest Art Deco urban complex. 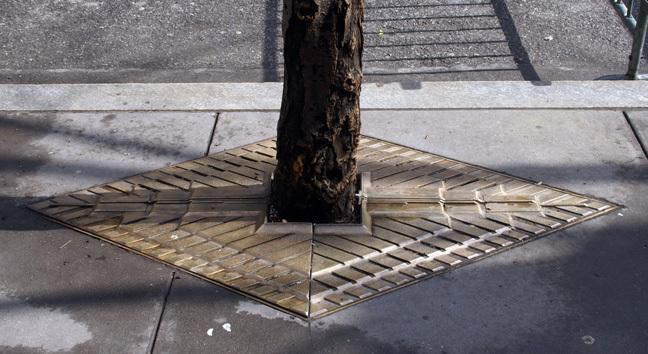 It proceeded with a major renovation that included the temporary removal from the sunken plaza of the Prometheus statue in early 1999 and placement on the sidewalk in front of the entrance to 30 Rockefeller Plaza and the opening of Christie's at 20 Rockefeller Plaza in late April, 1999, with a new and large, colorful abstract mural by Sol Lewitt in the lobby. The concourse spaces around the sunken plaza were also handsomely renovated. What would New York City be without Rockefeller Center's famous Christmas Tree, shown above? Not as joyous. What would New York City be with Puppy, Jeff Koons's marvelous botanical sculpture, shown above, that was installed in the Christmas Tree site in the spring and summer of 2000? A better place. 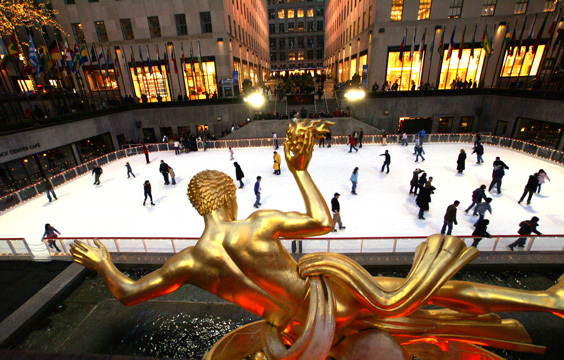 What would midtown be without Rockefeller Center? Not as important and not as great.